Warm days of playing in cool, freshwater rivers create many great family memories. 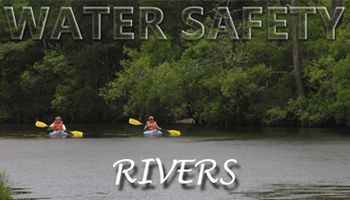 There are many recreational activities to enjoy on rivers such as kayaking, canoeing and tubing. Like with any water recreation, we should be play safe. Be familiar with types of wildlife. Know the river. Go prepared. 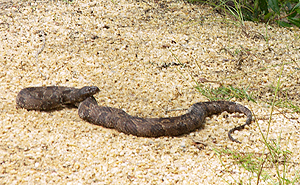 Water moccasins– It is likely that you may come across a cottonmouth water moccasin on the river, so be alert. A water moccasin is a venomous pit viper that may be seen sunbathing on rocks or swimming across the top of the water. They are brown in color and may have black markings around them. Preventing bites– Never chase snakes or get too close. Do not pick up rocks or fire wood unless out of a snake’s striking distance. Don’t walk in tall grass. Stay on the path. Most water moccasins bite because people try to get a closer look or poke at them and a bite from a water moccasin can be fatal. Treating bites– If you do get bit, immediately call 911. Wash wound with soap and water. If a victim is unable to reach medical care within 30 minutes, the American Red Cross recommends:Apply a bandage, wrapped two to four inches above the bite, to help slow the venom. This should not cut off the flow of blood from a vein or artery. The band should be loose enough to slip a finger under it. Alligators– Don’t swim in known alligator territory. Alligators are known for being less aggressive than crocodiles. However, they will become aggressive during mating or nesting seasons. Also, splashing around alligators may make them think it’s wounded prey; they may attack. If you see an alligator while out paddling just quietly keep moving and it should leave you alone. Know the river-Besides being aware of wildlife, it’s also important to know a little about the river before you go. Has there been a drought and the water is too low for paddling? How strong is the current? Was there a storm that caused limbs to fall into the river? Limbs and trees in rivers are called strainers. Strainers are just like the strainer used in the kitchen when draining spaghetti. The water flows through the tree and holds a water craft or a person against the tree. Boaters are like spaghetti against a strainer. The best thing to do is watch out and stay away from them. A strainer could make it hard to paddle. You may have to get out of your craft and pull yourself over the strainer and wait for help. 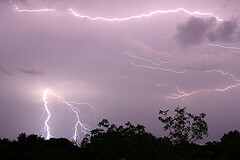 Storms– Is it thundering and lightning? You’ve probably heard it said before: “If there is thunder, there is lightning.” It’s never a good idea to be on the river if you hear thunder. In case, you are on the river and a storm arises. DO NOT seek shelter under tall trees. Stay in a low area and crouch down. If you are close to the end of your trip keep paddling and get in your car as soon as possible. What belongs in the cooler?-You feel safe and ready to go. You know what to expect on the river and now you need to pack the cooler. Think about how long of a trip you are taking and how many people you have. Don’t drink alcohol on a river. It’s against the law and endangers yourself and others. If it is an extra hot day, pack more drinks. It’s better to end up with too many than not enough. Drinks with electrolytes like Smart water and Gatorade will help keep you from dehydrating. 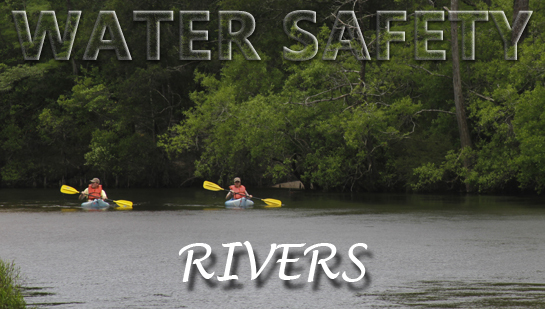 Whether you’re canoeing or just playing on the beach at the river, plan ahead and have fun! And as always, children should have constant adult supervision. It’s a good idea to talk to children ahead of time about the dangers of moving water and the types of wildlife they may encounter. I may never set foot in Blackwater River again after seeing that snake!!! Ok…I will try it but if I personally run into one, I am definitely never going back! 🙂 We have run into water snakes before but NEVER one that size! !